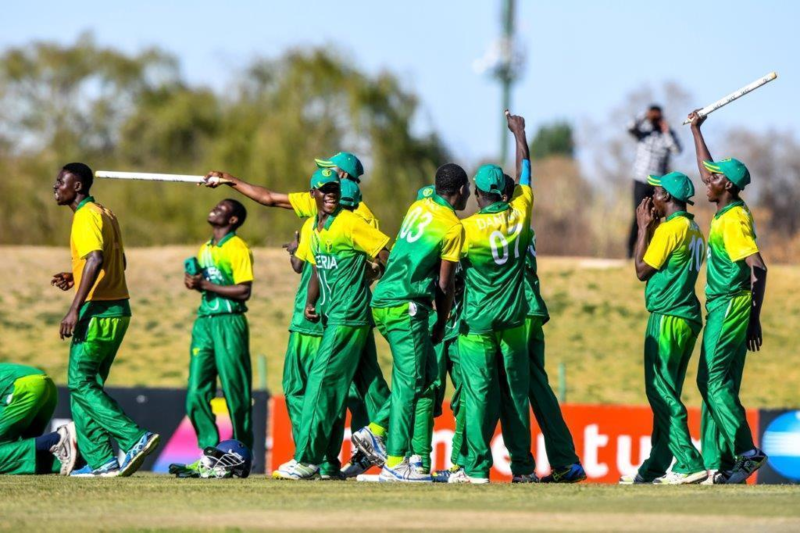 Nigeria’s Under-19 cricket national team got their odds of qualifying for the ICC World Cup tilting their way after beating tournament favourites, Uganda by 30 runs at the African Division One qualifiers in Windhoek, Namibia on Wednesday. The Junior Yellow Greens began the game on a struggling note as they lost 4 wickets in the first 15 overs with just 14 runs on the board but Captain, Sylvester Okpe and Samuel Mba’s partnership produced a life-saving 54 runs that eventually raised the tally to 110 before running all out at 48 overs. Equally, Mohamed Taiwo’s contribution to the Nigerian side went unnoticed earning him the Man of the match with a heroic statistics of 4 wickets for 26 runs in 8.1 overs. Nigeria is yet to lose a game in the qualifiers while leading the group of six with 6 points after winning three games. First, the West African side put up 52 runs upset over host Namibia before beating Kenya by 58 runs. Tanzania and Sierra Leone now stand in the way of Nigeria ahead of the World Cup in South Africa in 2020. For Tanzania, their qualification hopes are already crashed as they’ve lost all three games so far and will face Nigeria today.